Below you will find answers to the most commonly received questions. If you have a question that is not listed here, please use the form on our contact us page to submit it and we will get back to you with an answer as soon as possible. 1. Why should I choose House Signs In Slate to make my sign? We are a long established family firm with over 30 years experience in lettering house signs and commemorative plaques and we pride ourselves on our professional approach. We combine traditional skills with the latest technology to give you a first class product and service. 2. Should I choose a standard or large size sign? Standard size is perfect for almost all cases. Large size is suitable if visibility is paramount. 3. Do you deliver outside the U.K.? If you require a sign to be sent elsewhere, please e-mail us for a postage quotation. 4. How do I pay for my sign? House Signs In Slate, 25 Normandy Way, Bodmin, Cornwall. PL31 1HA. You can order by phone if you don’t want to use PAYPAL. 5. How do I fix my sign to the wall? Our signs come complete with screws and wall plugs. If no holes are required please indicate this on the order form. If hidden fixings are required please specify this when ordering in the special instructions box. 6. Can I order a special sized sign? Yes. If you need the sign to be a particular size, perhaps to fit into a recess, just e-mail the size you require and the lettering and we will provide a proof and quotation for your approval. 7. How long will it take to make my sign? During busy periods it can take up to 30 days for your sign to be delivered, it’s usually much quicker. Give us a call if time is a factor. 8. What guarantee do you give with the slate signs? We guarantee the materials for 2 years, excluding damage caused by incorrect fixing or accidental damage other than during delivery. 9. What if my sign is damaged during delivery? Please inform us immediately if the sign arrives damaged. Please keep the damaged sign and packaging for at least 30 days. If you can send or e-mail a photograph of the damage we will replace it free of charge if we deem it a correct claim. Our parcel carrier will only consider claims within 24 hours of delivery. 10. What are your refund and replacement terms? In the unlikely event of you being dissatisfied with the finished sign please contact us immediately giving the reasons for dissatisfaction. If you return it to us and we deem your complaint to be valid, we will either replace the sign, refunding the carriage costs, or give you a full refund. 11. What if I wish to amend or cancel my order? Once the order is received we usually start the work very quickly. If the lettering has not been started you can cancel the order and receive a refund or you can make amendments to your order. 12. What sort of material do you use? 13. How will my sign be delivered? Our slate signs are securely packaged in boxes and delivered by carrier. Most deliveries take place during the working day, if you are likely to be out it might be advisable to give us an alternate delivery address, phone number or a secure place that it may be left. 14. What are hidden fixings? With hidden fixings there are two pins protruding from the back of the slate, we will include a guide to help you attach the sign to your wall. 15. Are the letters painted on? 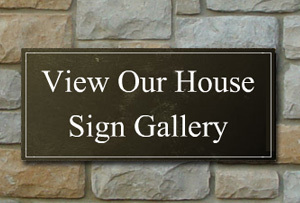 No, all of our slate signs have the names engraved into the slate and then painted with a high quality paint. 23.5 carat gold leaf finish available, price on request. 16. What are your opening hours? Monday to Thursday 8:00am to 5pm Friday 8:00am – 3pm. Give us a call if you want to visit outside these times.